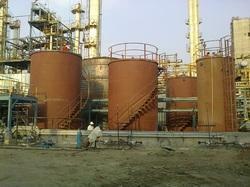 Service Provider of a wide range of services which include storage tanks. We have built a reputation in the market for supply of quality assured storage tanks & silos. Small storage tanks are manufactured at our manufacturing facility under strict quality supervision. Large tanks are erected at site. Our construction methodology for large capacity storage tank is “Bottoms up” i.e by jacking up the tanks ensuring speedy & safe erection. Looking for Storage Tanks ?